When you are facing debts, it may be very tempting to try anything available in an effort to better control your debt and possibly eliminate it. Certain methods of getting rid of debt, like obtaining a credit card, applying for a big loan to cover all debt amounts, and even debt consolidation may seem like a good idea to use to handle debt, but some of these methods can be more damaging to your credit. Nowadays, there are many debt consolidation scams that target desperate individuals seeking anything that can help them solve their debt problems. So, what can you do to make sure that you do not fall victim to any debt consolidation scams? Continue reading for more information on avoiding debt consolidation scams. The service requires a high monthly service fee while providing little work for the money that is being requested. The company takes minimal accountability when a client is dissatisfied. The monthly payments determined are very high. Funds are required to be taken from your bank account. There is no way to keep track of what the company is doing with your payments (i.e. paying off creditors, keeping track of your remaining debt). Sometimes, you do not realize that you have been involved in any debt consolidation scams until you are well into the process. However, most debt consolidation scams require that you pay an extremely high monthly payment, require high monthly fees for their services, and take little blame for any dissatisfaction that the client may have. There is not track record of the payments that are being made on your account and there is no way to prove that the company is even using your payments to pay off creditors. Some debt consolidation scams take payments directly from your bank account without your consent. When you try to contact the company for answers, you are unable to locate a reachable number, address, or email. 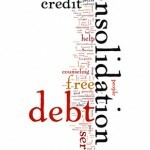 Instead of receiving calls from your debt consolidation company, you are still receiving calls from your creditors. Despite you paying tons of money toward your debt consolidation, you are still able to be sued by creditors because none of your money is being sent to them to satisfy your outstanding balances. Because of the debt consolidation scams, you are now at risk for losing any valuable assets and even more money than you have invested into getting rid of your debt. If you have been a victim of any debt consolidation scams, you may be even more hesitant to search any further for a reliable debt consolidation company that can really help you to resolve your debt issues. But first, there are some crucial steps that you must take. Firstly, if your payments are being drafted from your account, you should close the bank account immediately to avoid any further transactions. Also, you can check the contract that you signed and update yourself on the laws of your state. In some cases, you may be able to sue the company that is claiming to be a debt consolidation company. It is also a great idea to contact your creditors to inform them of your intent to settle your debt but of the scam of which you were unknowingly a part. The last step is to do thorough research from good debt consolidation companies that will help you to solve your debt problems. A good place to start is with your financial institution. Your bank may be able to provide you with a list of debt consolidation programs that may be beneficial for you. If not, you can search online for debt consolidation companies but beware—the internet is probably where you came across your first debt consolidation company that turned out to be a scam. There are tons of reliable Debt Relief Companies that specialize in debt consolidation and will help you get on the right track if indeed debt consolidation is the right solution to your debt problems. Being involved in any of the debt consolidation scams that are out there can turn your bad debt into horrible debt, so you must make sure that your debt consolidation company is there to work for you and not make you work harder to handle your debt. If you have already been a victim of a debt consolidation scam, do not be ashamed or hesitant to try again. There are many of individuals who have been bamboozled by a company claiming to help individuals solve their debt issues. Do thorough research to ensure that the company you are reaching out to is willing and able to give you a helping hand.